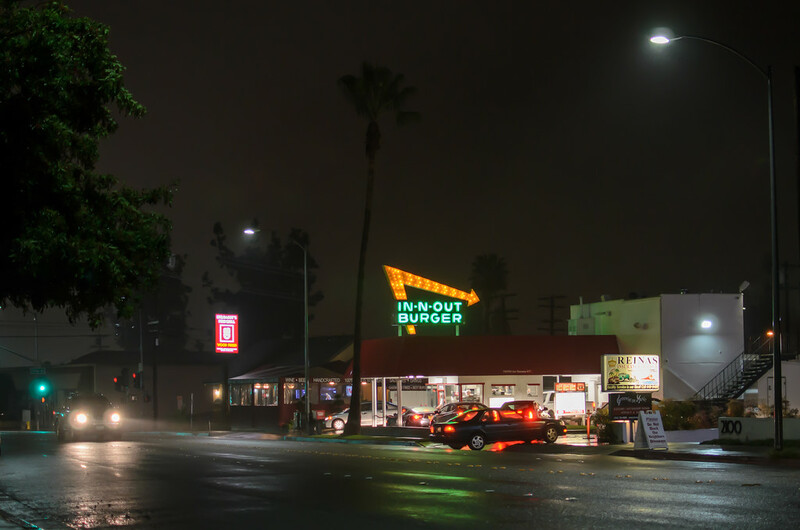 Every time I go to the In-N-Out in Pasadena, I end up taking a few photos. 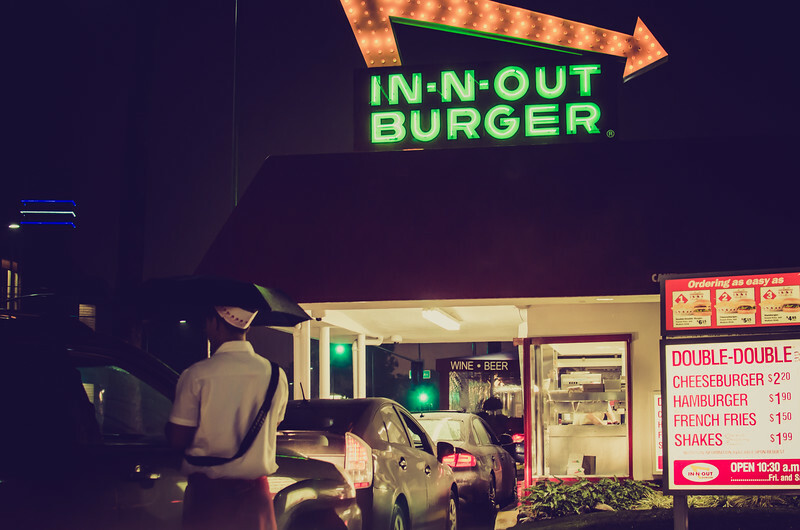 It's one of the old-timey In-N-Outs -- basically just a pair of drive-thru windows and a couple of benches. I find the place terribly photogenic and a nice little slice of Americana. I don't know if any of these efforts are anything great, but I kind of dig them. 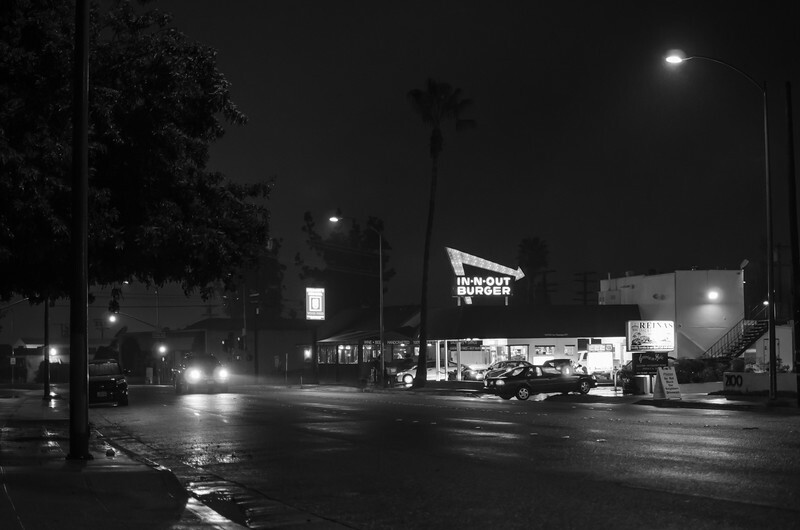 I converted the above one to black and white because I liked the tones and the In-N-Out as both the primary source of light and obvious gathering point for any cars in the area. (Here's a color version for sake of comparison, albeit cropped tighter). The bottom photo was processed in Lightroom using a lomo preset I downloaded from the Adobe site. Interesting. Both photos were taken with my Nikon D5100 with a 35mm 1.8 lens that's great for night photography. Interestingly, there isn't much in the way of inspired photography of In-N-Out Burgers on Flickr with the exception of many loving closeups of Double Doubles. I guess people get so hypnotized by the food they forget how to take a good picture; I know it wasn't easy taking these photos with a sackful of food smelling very good on my front seat. Please feel free to check out some of my other work at my SmugMug site and then spend gobs of money on prints, merchandise and digital licenses. And follow me on Twitter. These photos are © Steve Hymon and may not be used elsewhere on the Internet or in other media without the advanced permission of Steve Hymon.